Walking along the picturesque streets of Beacon Hill is an immersion into a 19th-century English-inspired neighborhood that's rich in history and charm. Learn how to compose amazing pictures of Beacon Hill’s diverse architecture, antique gas lamps lining the brick sidewalks, colorful flowers spilling out of the window boxes, the most photographed street in Boston as well as an exclusive enclave and other surprises hidden in unexpected places. 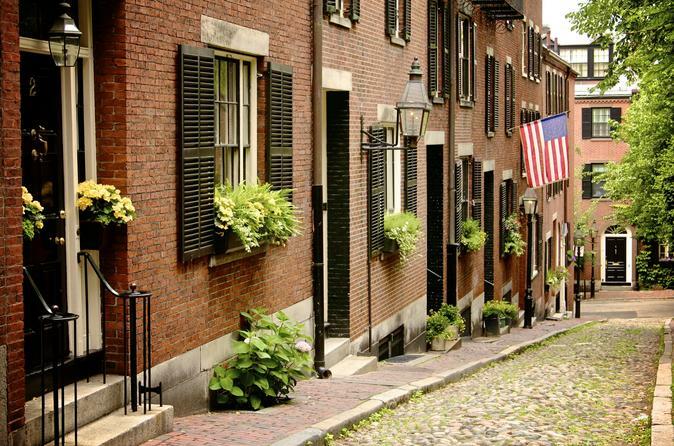 Fascinating commentary on Beacon Hill's historical sites along the itinerary is also provided throughout the tour. This photo walking tour begins at the Robert Gould Shaw Memorial, located directly across the street from the gold-domed Massachusetts State House, near the corner of Beacon and Park Streets in Beacon Hill. Meet the professional photographer guide and the rest of the small group for a brief introduction to this 90-minute adventure. Walking along the picturesque streets of Beacon Hill is like wandering into a 19th-century, English-inspired neighborhood — rich in history and charm. On this photo tour, learn how to compose amazing pictures of Beacon Hill’s diverse architecture. Capture the colorful flowers spilling out of the window boxes, the antique gas lamps that line the brick sidewalks, and the most-photographed street in Boston — Acorn Street — as well as an exclusive enclave and other surprises hidden in unexpected places. Throughout the tour, enjoy an ongoing commentary on Beacon Hill's history and the many points of interest along the way. As an added bonus, the 'PhotoWalks Guide to Creative Photography' is included in the tour price. This valuable e-booklet provides information on maximizing photography skills, with user-friendly explanations of camera settings and more. Special Offer - Book and travel by July 31 and save 12% off our previously offered price! - Book Now!